New blood coming to Congress? As government bureaus gradually reduce the list of delayed statistics, and as we get a better picture of what happened in the economy last September, the big news is that nothing much has changed. The economy was growing moderately/modestly (disappointingly slow for just about everyone's tastes), and it's probably still disappointingly slow. But as I've been saying since January, from an investor's perspective, avoiding recession is all that matters. The big news, in other words, is that the economy is not getting weaker, nor is it entering a recession. It's still growing, and that's good news given market pricing. When the yield on cash is essentially zero, and when the yield on default-free, 2-yr Treasury notes is not even 0.5% per year, whereas the yield on riskier investments is far higher (see chart above), the market is effectively braced for a recession or at the very least for some rough sailing. This may not be what the opinion polls say or what the surveys of investor optimism or pessimism report, but it is the message of market pricing. In the absence of extraordinary volatility, markets at any given time are in an equilibrium: right now the world's investors are just about indifferent between earning nothing on cash and only 0.3% per year on 2-yr Treasuries, or 4-8% on corporate bonds and stocks. Behind that relative indifference lies the expectation (or fear) on the part of the owners of tens of trillions of dollars of cash that even though corporate stocks and bonds promise significantly higher yields, the downside risk of holding those riskier investments is so great that the extra yield they offer is not worth the risk. The risk/reward expectation for stocks, in other words, is only marginally enticing to investors (we know that because stock prices are rising), even though the alternative is quite unattractive. Stocks are moving higher because, on the margin, there are more investors opting to take on a bit more risk. The longer we go without a recession or a significant economic setback, the more this will be the case. For an investment in cash to break even with an investment in equities, for example, equities would have to decline in price by at least 8% (i.e., by enough to offset the dividend yield of almost 2% and the expected increase in earnings of 6%, which is the current capitalized value of earnings). That's not impossible, of course, since stocks routinely go up and down by several percentage points every week, and there was a 5.8% correction in the S&P 500 in the second quarter of this year. But in exchange for this moderate volatility, an investor who held a position in the S&P 500 for the past year has made a total return of 28%. 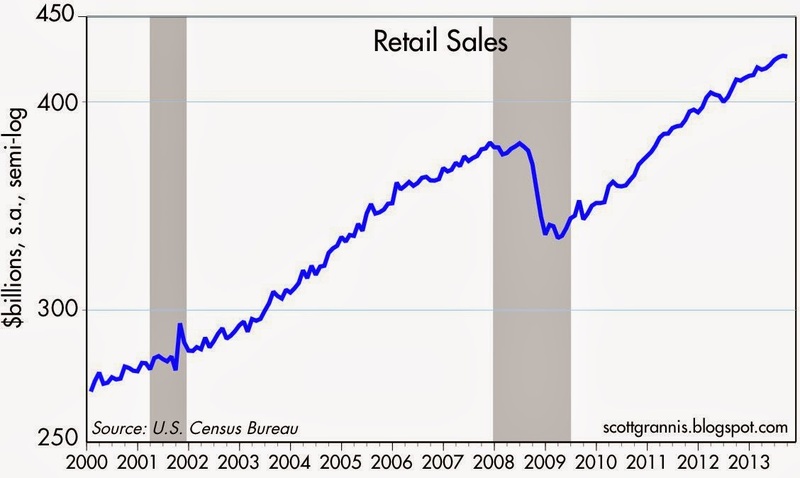 Back to the latest economic releases: Retail sales were a bit weaker than expected, but they continue to rise at a 3-4% annual pace. Subtracting the more volatile sectors, and looking at long-term trends, we see the same picture in retail sales that we see in nominal GDP: there has been a huge shortfall of growth that followed in the wake of the Great Recession, and growth since then has been sub-par. But it's still growth. 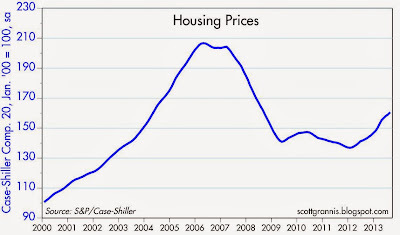 Housing prices staged a pretty impressive recovery this past summer, but things have been cooling off since, mainly due to higher mortgage rates. 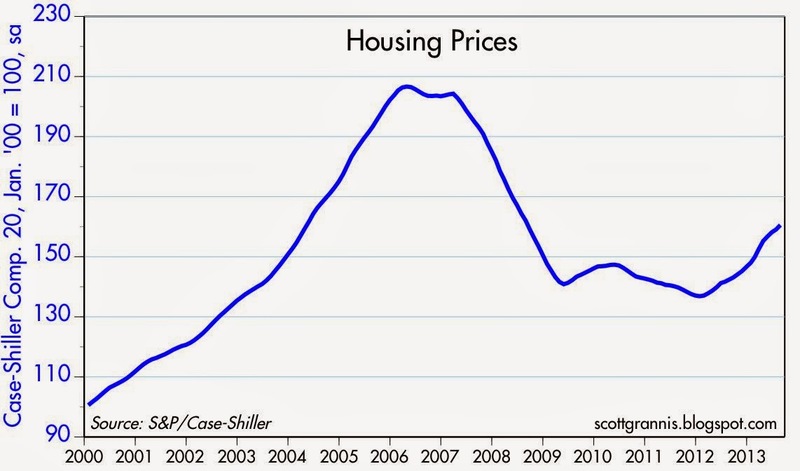 Still, it sure looks like we've seen the worst for the real estate market. 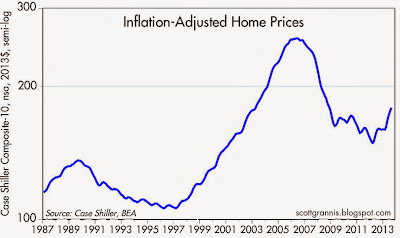 In real terms, the recovery in housing prices hasn't been quite as impressive, but prices today are still substantially higher than they were in the mid-1990s, thanks mainly to much lower mortgage rates. The rise in mortgage rates of late has been a negative, but from a long-term perspective housing is still very affordable. 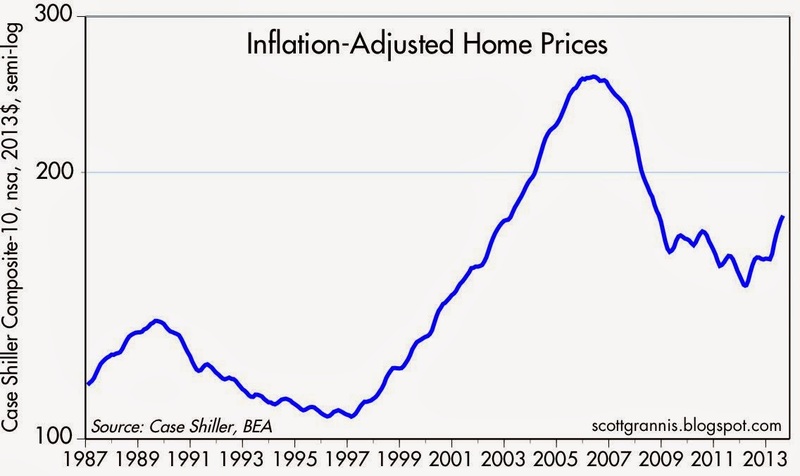 That argues for slower growth in prices for awhile, but not another decline. Equities are up at strong double-digit rates over the past year, and that has many folks screaming "bubble!" Corporate profits now stand at all-time highs, so the market is not necessarily crazy, but a portion of the gain in equity prices this year is due to an expansion of multiples. Yes, people are finally starting to pay up for a dollar of earnings. Are things getting out of line? Hardly, as the chart above suggests. 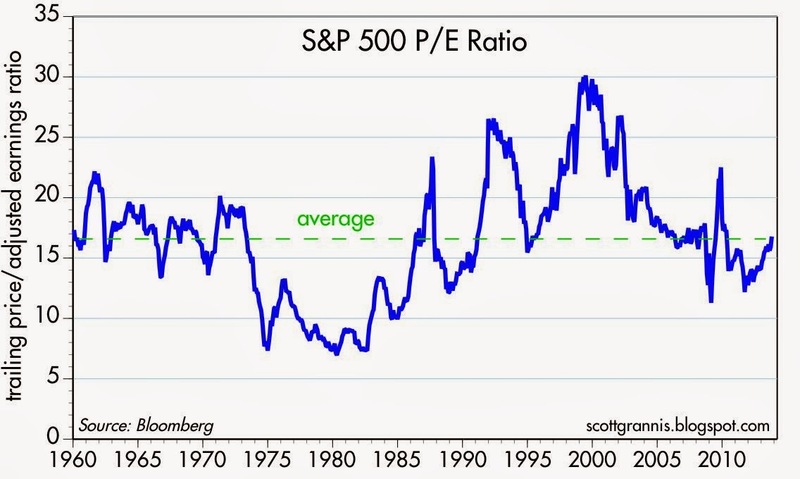 PE ratios are now exactly equal to their long-term average. When PEs get to 20 or more, then we can talk about whether stocks are in a bubble. 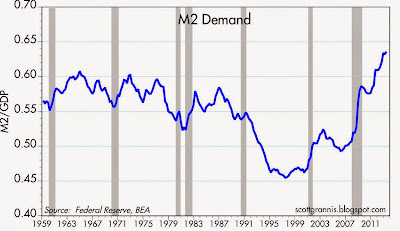 U.S. banks currently have over $7 trillion in retail savings deposits, and that represents about two-thirds of the M2 measure of the money supply. 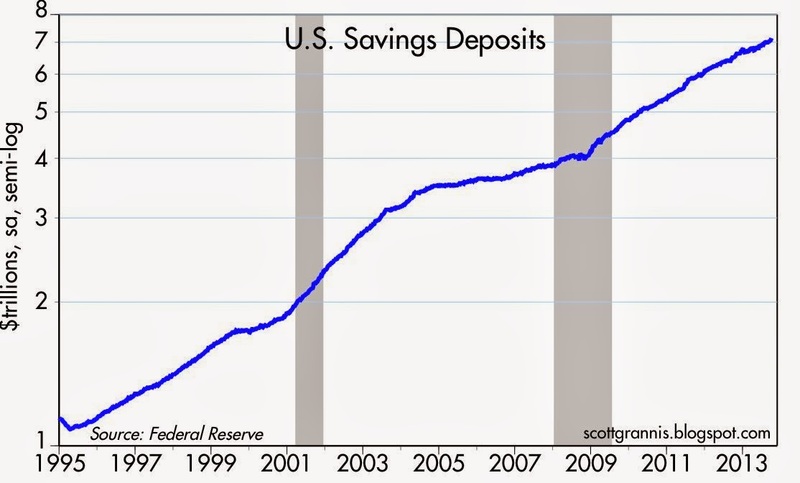 That's the highest ratio of savings deposits to M2 that we've ever seen. 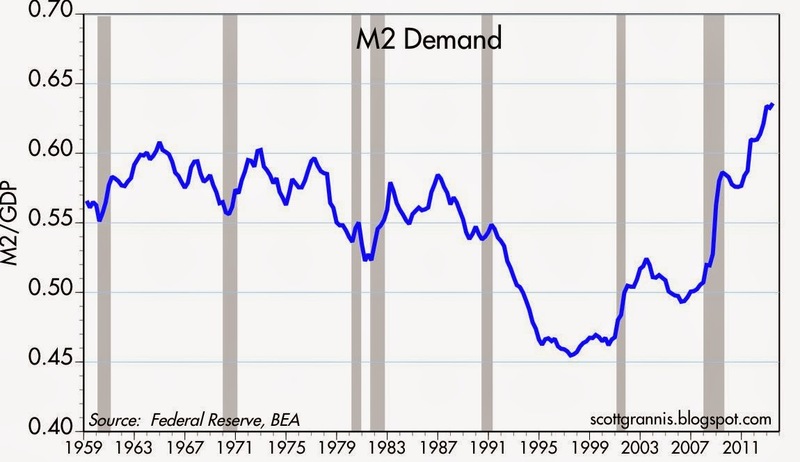 At the same time, the ratio of M2 to nominal GDP is also the highest we've ever seen, as shown in the chart above. The huge accumulation of cash, cash equivalents and savings deposits shown in these charts is the measure of just how risk-averse the world still is, especially considering the almost-nonexistent yield on cash and cash equivalents. In short, there's an awful lot of cash out there that is proving to be very embarrassing. As I said back in January, the Fed's QE bond purchases and zero interest rate policy are designed to convince investors that holding cash doesn't make sense. This message is driven home every time there is an economic data release that shows the economy is continuing to grow, however slowly. 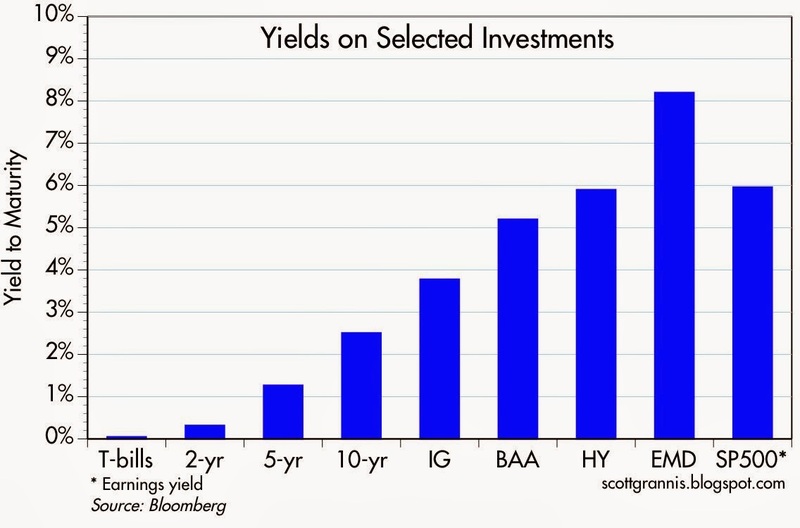 The world can't make its cash holdings disappear, of course, but on the margin investors are trying to reduce their cash holdings in favor of the much higher yield on riskier assets. This results in a change in relative asset prices which will ultimately drive the yield on cash higher as the yield on riskier investments declines (i.e., as the prices of riskier assets rise). Great wrap-up of the economy and investment picture today. Tons of cash on the sidelines, everywhere you look...in hedge funds,mutual funds, banks, sovereign wealth funds, pensions etc etc etc. If investors every become bullish...look out above! All that matters is to avoid a recession? Good God! The general P/E is much higher than the chart of the S&P 500; in fact, it is perilously high to its previous highs before they crashed. BOCO, a pro-business Demco, why him and his first lady are both socialist revolutionaries of the first order, born in the counter capitalists corridors of academia..
Scott, thank you so much for what you do. Last weekend there was a major article in the WSJ with the title, CHINA'S COMING SLOWDOWN. The article stated that history shows that every economic miracle eventually loses its magic. Although the article was about China's growth, my concern is about US economic growth. Is there a "new normal," as Bill Gross would state it? Must our growth be reduced to 2% or less simply because of our size? Can we grow at 4% and what would it take to get us there? 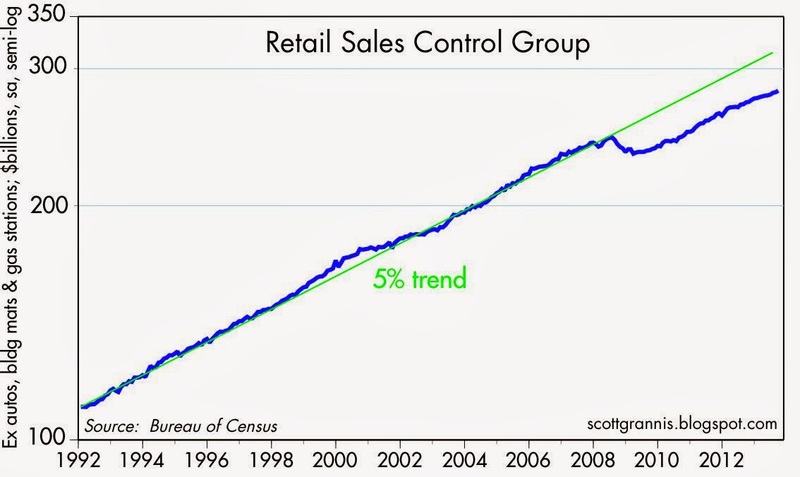 I am really concerned that we are going to settle in at 2% or less growth and be happy with it. In other words, we're going to look just like Europe. If that happens, where will be the American dream? How will our children and grandchildren enjoy a higher standard of living than we? Our future is very distressing to me. I want prosperity for all. I want a tide that lifts all boats. I fear we'll never have this, and the poor will always be poor, while the rich could become poor. I am truly puzzled by the "$7 trillion in retail savings deposits". Dividing $7 trillion by the US population at end of 2012 (314 million) yields $22,293 for each person including children. When one reads that the average net worth of an American age 50 is $98,000 including home equity, etc. , I find the number $7 trillion very difficult to fathom. 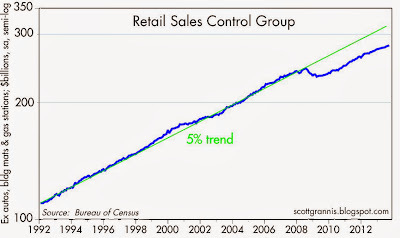 Do "retail savings deposits" include CDs? What else does it include besides passbook saving? Ben Jamin, boy I sure hope you are right! No Rotham nor Uncle Joe! Jesus, Scott. Bonds and stocks are not the same. With bonds you get 100% back, with stocks that amount is uncertain. Apart from the fact you ignore vastly different priorities in terms of capital structure there is no reason why stocks and bonds should yield the same. Also, from an investor standpoint, most cannot freely choose between stocks and bonds. Please stop writing nonsense. 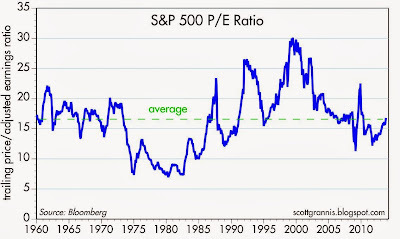 Regarding the chart on the P/E ratio ("the stock market is not expensive"): what would that chart have told you in 2007? See, it's useless.